This is yet another recipe borrowed from Cook’s Illustrated. I found it in the big baking book they published(I got it for my birthday a few years back), and I’m pretty delighted with the recipe. I don’t do it exactly the way they said to(I didn’t want my crust to be shatteringly thin like they did), but the basics of the recipe are theirs. This pizza is delicious, but my favorite thing about it is that the dough is supposed to be made ahead of time. When I have to be out and about on Friday afternoons, we can still have pizza for dinner if I use this recipe. It’s supposed to sit in the fridge overnight, but sometimes I forget to make it the night before…so, I’ve mixed it up in the morning, refrigerated it, and used it that evening with very satisfactory results. You can keep the dough in the fridge for up to 48 hours, but I’ve never managed to think quite that far ahead. Ahem. 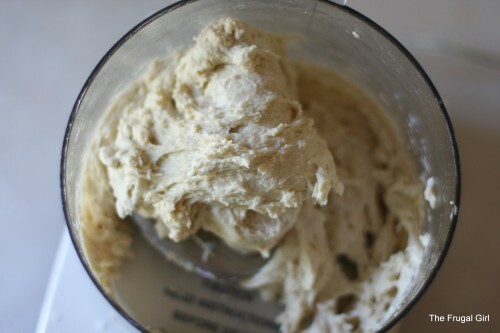 The dough is made in the food processor and then kneaded just briefly by hand, so all you people out there with kneading phobias can probably still handle this recipe. Incidentally, you will need a pizza stone, pizza peel, and parchment paper to make this recipe(well, I suppose you could do without the pizza peel and the parchment, but the pizza stone is non-negotiable!). 1. Mix everything but the water and oil in the bowl of the food processor(in case you were wondering, I did mix mine up after I took this picture. It’s just that it looks sort of boring mixed up, so I thought a pre-mixing picture would be better. Not that I overthink this type of thing.). 2. Add the water, and process until the ingredients are all combined. 3. With the lid on and the machine running, add the oil in a thin stream, and process until the oil is evenly mixed into the dough. 4. 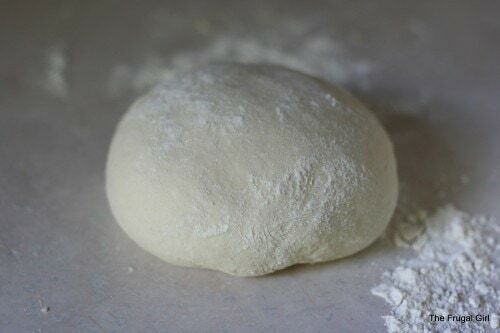 Turn the dough out onto a lightly floured surface, and knead for a couple of minutes…just until it’s smooth and even. The food processor will have done most of the kneading for you. 5. 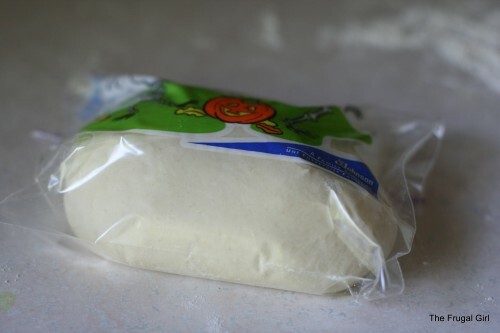 Put the whole dough ball into a zipper bag(using one you purchased on clearance after Halloween is totally optional), and refrigerate it overnight. 6. About a half hour before you’re ready to bake the pizzas, put your baking stone into the oven and heat it to 425 degrees. While the oven is heating, take the dough out of the fridge, divide it into two balls, and let them sit on the counter for a few minutes to warm up. Meanwhile, cut two squares of parchment paper about the size of your baking stone. 7. When your dough balls have lost their chill, roll them out on a lightly floured surface to about 12-14 inches in diameter(Cook’s says to do this on the parchment, but I can’t get the hang of that!). Once they’re rolled out, place them onto the pieces of parchment and use a scissors to trim the parchment around the pizza. 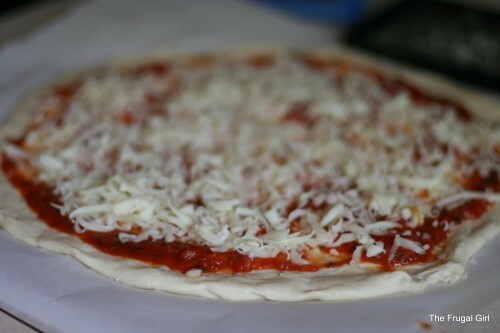 and sprinkle with cheese(you can add sausage or pepperoni or any other toppings you like at this point). 9. 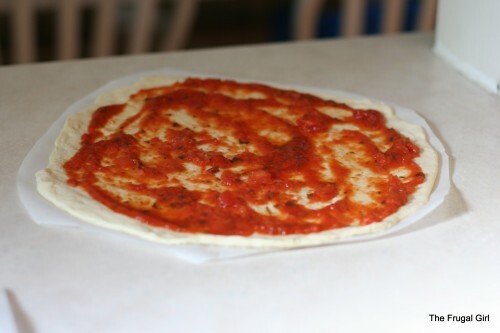 Place the pizza, parchment and all onto your pizza peel, and slide it onto the hot baking stone. Bake for 10-12 minutes, or until browned. Serve promptly, because this pizza doesn’t stay warm for long(unlike deep dish pizza). While the second pizza is baking, we usually sit down and eat the first. Usually by the time we polish that one off, the second one is ready to eat. Hi – I have nominated you for a Lemonade Award! I love reading your blog and learning of new tips and tricks for saving money! Come on over to my blog to pick up your award. On another note – my 14 year old son saw your pizza pics and is asking for me to make it Maybe I will get him to make it!!! hey I always have issues with making my own dough… it never rises!! so here is my Q, do I need to treat the yeast first?? Would any other Canadians like to chime in? It is possible before that you had too cold an environment(yeast needs warmth to grow), or that your liquids were too hot and killed the yeast, or that you added the fat with the yeast, and coated the particles, so they couldn’t rise…there’s lots of different reason that yeast might not rise, but I bet you will be fine with this recipe. Do you have a food processor? this looks yummy !! I should try this recipe next time ! ! now i’m just waiting for someone to come fix my oven. Hi, I’m from Canada and I make yeast bread all the time. The biggest reason for not rising I think is usually the water not being the right temperature. If it’s too hot, you kill the yeast. I have done that before, for sure. It does help to keep your dough in a draft free place, and cover as well. I don’t think yeast knows we are Canadian, though. It’s just a bit picky and takes practice to get it right for your exact conditions, (igloos might be tough, ha ha I use Fleischmann’s. It works very well. I buy it because my mother does and she makes wonderful bread. I love this blog, it’s so full of common sense. Thank you. Oh my Kristen. This looks outstanding! Thanks for the simple crust recipe. I mostly use Amy D’s (Tightwad Gazette) one hour bread recipe for pizza crust. But sometimes, that crust does not rise! It’s the oddest thing. YAY Pizza! I’m making crust this very minute. I agree; yeast here is no different from down south. However, Jenny, how old was your yeast? I have noticed that older yeast works much much worse, especially if it hasn’t been stored in the refrigerator. So maybe buy a new package and try again? Hi Kristen, we just tried the thin crust pizza. It worked out really well. I used all fresh milled wheat. Well, actually it was kamut. I also used the olive oil. Parchment paper made the day. I would like the bottom of the crust to be crispier, like the outer edges were. I might try pre-baking it next time. I also made it and left it in the fridge for a couple hours…which could have made a difference. Thanks so much for the recipe, I’m thrilled that it worked with all wheat. thanks for the input. I just bought new pouches of yeast and will try again. Just a note to tell you that today I mad the Crunchy Granola that you postedsome time ago. It turned out spectuclar and I have never made better. Your recipe is supurb. Thanks for all the picutures and all the help. Great recipe. I have always used a recipe from The America’s Test Kitchen cookbook, which is the same company as Cook’s Ill. It’s similar but I like that this can be made ahead of time. To roll the dough on parchment paper, I find it’s easier to put a layer of parchment on the top too. then you can roll without the dough sticking to your roller. Thanks for sharing this recipe, can’t wait to give it a try. i love your recipes, but it is just my husband and I so eating 2 pizzas in 1 sitting is too much for us. so question is – can you freeze the dough? if so – how long will it keep? Alternatively, you could make one pizza one night, keep the rest of the dough in the fridge, and bake another pizza the next night. The dough would be fine in the fridge for another day. I love your dinner ideas. We actually do make-your-own pizza night and the kids love it. They roll their dough out and put whatever they want on it (which I have out on the table). As soon as they roll it I place it on an upside down cookie sheet that has corn meal on it. They then decorate it as desired and I take it over to the over and easily transfer it on to the pizza stone (because of the corn meal). The kids have fun with different thicknesses of dough, different shapes of pizza and different topping combinations. It’s fun and creative! Thanks for all the great info and tips. You are inspiring. What kind of food processor do you use? I am looking at buying one and the choices are too many! Everything I read about them talks about not being good enough to make dough which is what I really want. Pizza looks awesome btw. I really want to try it! I have a Cuisinart food processor. It’s just a basic model. I don’t use it to make bread dough very much…mostly just pizza dough. Mine isn’t anything extraordinary, but I’ve never had trouble using it to make pizza dough. I decided I can’t afford a food processor right now, can I make this with my mixer? I love that I can make the dough the day before! Yeah, I’d certainly give it a try. There’s nothing particularly special about doing it in the food processor other than that it’s a little easier and faster than in the mixer. 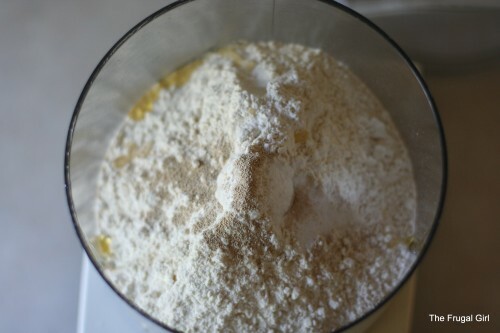 You might not want to add all the flour right away if you’re doing it in the mixer, though…leave 1/2 cup or so out at first and mix it in after you’ve added everything else. I think the mixer might have trouble mixing the dough if you add all the flour initially. I didn’t know how I was going to get two pizza’s out of this, cause I usually make a thicker crust pizza, but I did and they were awesome! I will be making this again and again! Is instant yeast different than active dry yeast? Actually, I would love to know the answer to the instant yeast question too! I went to Sams to buy yeast in bulk and all they had was blocks of the instant stuff for $4. Not bad, but since I didn’t know what it was really I didn’t but it. Oh and word to the yeast virgins, DO NOT BUY YEAST AT JEWEL! My other grocery stores didn’t have the stuff in a jar, so I went there and spent $7.99 on 1! OMG! Then i went to Target to pick up a card and found it for $3.99 there! Geez! Yup, the instant stuff is the same stuff that I buy at Costco. It works fine in all of my recipes and is SO cheap. Do you use the same amount as Active Dry? I’m totally preparing this tonight for dinner tomorrow. I do not have a pizza peel, but google told me a rimless cookie sheet will work just the same! Typically I fear any recipe with dough! I don’t want to sound silly. But I had a doubt. I don’t own an oven, but I do have a microwave. 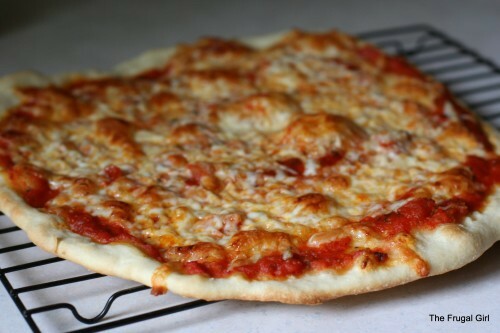 Your thin crust pizza seems like it is so easy to make, so I thought (esp. since it IS a thin crust) it would work in a microwave as well. But the pizza base doesn’t seem to be cooking well in a microwave. So I wondered if you had any experience with baking stuff using a microwave. Or should I save, and buy myself an oven? A microwave will definitely not produce a proper pizza crust. The heat it puts out is just too moist and the crust will be rubbery and will not brown. So yes…if you want to make baked goods, an oven is definitely the way to go! well, it did turn out rubbery as you mentioned. Told my hubby today to gift me an oven for my birthday in May instead of clothes… So this would be one of the first things I would try once I have an oven. Thanks Kristen. What if I don’t have a stone? What would the temp of the stove be If I use and regular pizza pan? I have made this recipe without a stone. I use the same temp, and a preheated thick cookie sheet or 9×13 pan instead of a stone. The crust isn’t quite as crisp but it works pretty darn well. This turned out SO great! Thanks for the awesome recipe! How would you make this without a food processor? 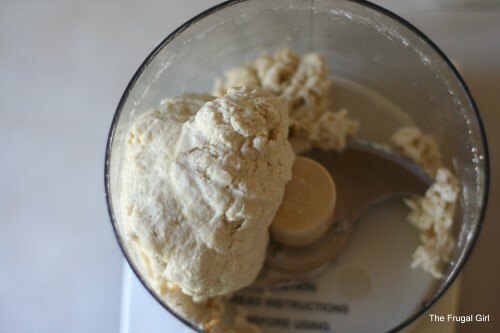 Do you need to proof the yeast first, or just mix everything together and knead for a few minutes? I would dissolve the yeast in the water first and then add the other ingredients. I’ve done it that way before and it was fine. Just had to let you know that I tried this last week and it was wonderful. I’ve tried various pizza dough recipes over the years and none was quite right .. this takes the cake. The whole family liked it, and even the picky eaters finished their plates. Thanks. Do you use preshredded cheese or do you get a block and shred it yourself? I am new to pizza making and trying to find the cheapest way to do it. Thanks! I tried this recipe and it turned out awesome. Making it in the food processor makes it so much easier. I made 2 batches and I am going to try and freeze one to see how it turns out. Thanks! I have used this recipe several times, by hand, and it is always great. Using it again tonight to make individual calzones since tonight is going to be a rushed dinner-on-the-run. Thanks for all the amazing recipes you share with us. Thankfor the receipe. I was wondering have you ever tried whole wheat flour for any of your pizza receipes? I haven’t! You could give it a shot, but the results will be a little different. Thanks for the recipe. I tried it and it turned out very good. 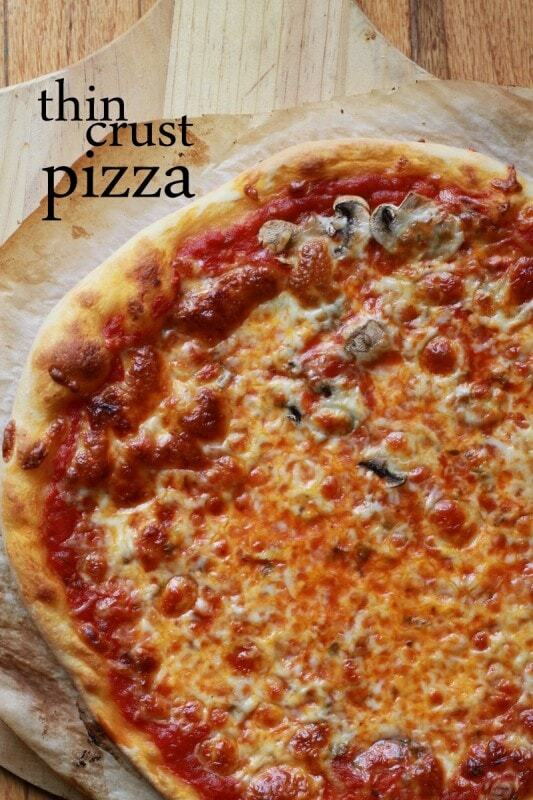 Have you ever tried any of the pizza recipes you have with whole wheat flour? I haven’t! So I’ve got no advice for you. Do report back if you give it a shot, though. I would like to mix the dough and make the pizza immediately. Is it okay to skip the “refrigeration” part mentioned in the recipe ? Also, we buy 5 pounds of whole wheat flour for 4$. In your “cost of homemade bread” post, you’ve mentioned you pay more like 2.50 for 5 pounds. Is that the price for all-purpose-flour (or) whole wheat flour ? For the cost of bread post, that would be for white flour, as I was comparing white storebought bread to white homemade bread. I’ve never tried the no refrigeration method for the thin crust pizza. You would definitely want to let it rise an hour in place of the refrigeration time, though. Thank you for the prompt reply !!! Made it just now with whole wheat flour and it turned out awesome. Refrigerated the dough overnight and made it today. Since I had already refrigerated the dough before seeing your reply, I decided to stick to the recipe. Bought pizza stone and peel as suggested by you and they are worth the money for sure ! Also, thank you for clarifying about the flour price. Yes-the pizza stone and peel make SUCH a huge difference. Glad yours turned out great! Recipe looks great but I’m wondering if you mistyped or if #6 in the instructions is really missing. I’m going to make for lunch tomorrow and I hope it comes out as good as your pictures. Oh, my numbering was wrong! I fixed it now. Thanks for pointing that out. Hi Kristen, Have been using this recipe for some time now. Just wanted to check with you if the flour used in this recipe is Gold medal or King Arthur’s bread flour ? This post says Gold Medal but I read in another pizza post that you prefer King Arthur flour. Can you please clarify, Thanks ! For my regular crust pizza, I love King Arthur. But I believe this recipe from Cook’s specifically called for Gold Medal unbleached, so that’s what I use! Thank You very much for the reply !